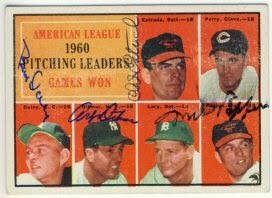 Today I received my fourth autograph on my 1961 Topps Pitching American League Pitching Leaders card. 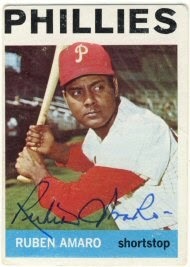 The card is already signed by Milt Pappas, Art Ditmar and Chuck Estrada. I think I'll send it off to Frank Lary next. He can be slow to respond sometimes, but is still very dependable. 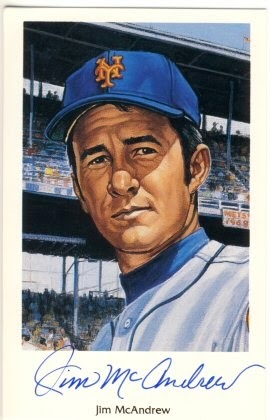 But I might not see this card again for a while. I've made a couple Ebay purchases lately. 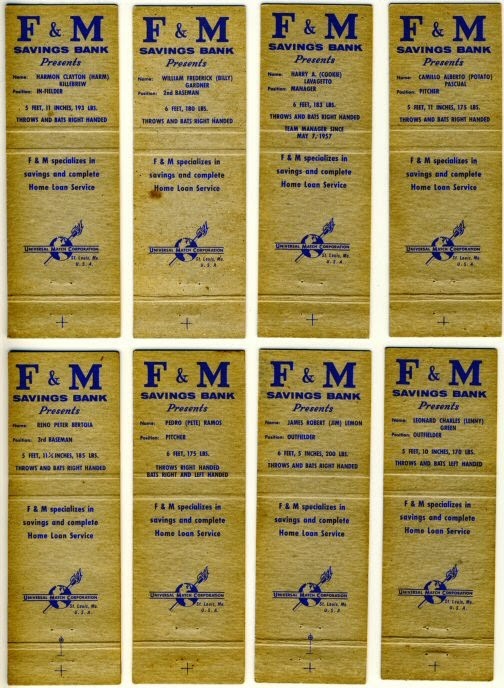 I like buying oddball stuff from the 1960's, and these matchbook covers fit right in. Each has a player's picture on the cover, and inside there are just a couple of stats, including position, height/weight and handedness. I thought I'd get back more then I did this week, but today I received two returns. 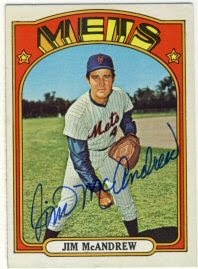 Jim McAndrews signed his 1972 Topps as well as a Ron Lewis 1969 Mets postcard. 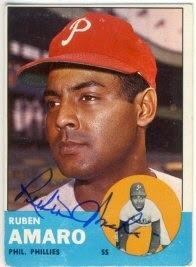 Ruben Amaro signed his 1963 and 1964 Topps. 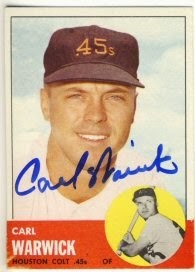 This is the 25th 1963 Topps I've gotten signed this year, reaching the halfway point of my goal for the year. 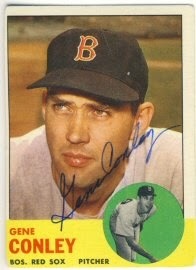 Yesterday I received two more 1963 Topps. 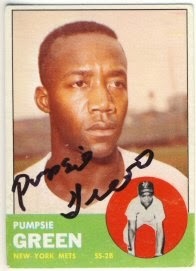 Both Pumpsie Green and Carl Warwick signed their 1963 Topps for me, Each charges $5 to sign cards. I received two more returns today. 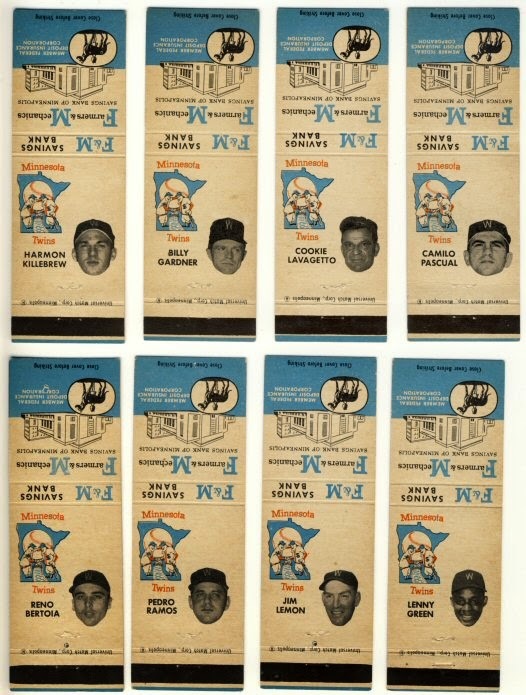 I've gotten to the point that many of the 1963 Topps I still need are from players who charge, so I enclosed $5 in these requests. 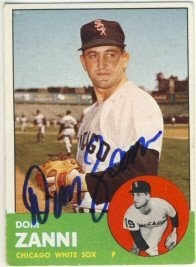 Both Gene Conley and Dom Zanni signed their 1963 Topps in about two weeks.